Things have really changed! I was a young woman living in West Texas on a ranch in Comanche county then. Living nine miles from pavement I was relatively isolated. My parents lived in the large city of Dallas 120 miles away, and I would load my two little girls in the car and make that drive on slower old roads over the hills and through the woods to grandmother’s house every few months. What an interesting grandmother she was for them! My mother loved old toys and old dolls and miniature rooms and doll houses which she made with assistance from my father. A trip home for a visit always included involvement in her latest project. Once I returned to the ranch with a fine old Teddy bear to mend, a find from the Goodwill store where mama loved to dig and search. On another of these trips Mama offered me a doll she had found, needing a wig and restringing and clothing. By taking her home, I was hooked! To buy doll elastic I sent for a Mark Farmer’s catalog as advertised in Hobbies magazine. Soon I was reading the doll pages of Hobbies mag each month and sending the required SASE for mimeographed listings of dolls and parts for sale. Buying from these lists sight unseen with very few of the items pictured was almost a shot in the dark. In order to describe the item offered, the seller would cite page and book for illustrations from the few doll books available. Claire Fawcett’s Guide was a popular reference. Collectors gave names to different china heads such as Mrs Bumblebottom or Mary Lincoln or other titles from these early books. In this way you could know about what you were ordering if you sent for a doll with a head called Dagmar. Some of these names persist until today. 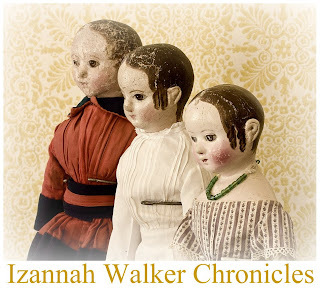 Very early on, I desired most an Izannah Walker doll as pictured in Mrs. Johl’s books and an American Greiner doll which I did not own until the 1970’s. I had almost no money at all for dolls. I could manage a bit from the grocery money to buy a china doll head for $2.35 or such. But I was excited over my new hobby and set out to see what could be discovered locally. The town of Comanche about 15 miles from me, had as all small towns did, a junk shop or two. In these I asked after china dolls. One shop keeper said he had seen a doll head at the iron man’s place. It was common in a small town for someone to put old pieces of iron in their front yard hoping to sell or swap them. These pieces of old farm equipment or hoes without handles and other iron pieces were often found as the iron man would check the city dump grounds on a more or less regular basis. When I found the iron man he told me yes he had had a little chine doll head from the dump grounds and sold it to Mrs. Dofloppy down the street for 50 cents. The iron man’s grandchild had been playing with the little head in a coffee can in the dirt of the yard. Coffee cans of that time were wide and squat. I knocked on the door there and was admitted to the living room to visit this woman, and I soon spied the little doll head sitting on top of a bud vase on a shelf. This perch on top of the flared vase gave a “body” to the little head, which was without it’s shoulders. I was able to purchase the doll head for 75 cents. I clasped my first real antique doll find and was thrilled with her! She was a little common blond head, needing everything. Hands and feet were ordered from Mark Farmer, and I made the doll a body and a dress, and named her Resurrection! I was not to have her long. My mama came from Dallas on a visit and grabbed Resurrection and announced that She must have the doll. My protests counted for nothing. Mama was building a salt box doll house and intended to show it in the State fair that October and 6 inch tall Resurrection was the very doll she needed. So in less than a year, Resurrection went from the Comanche city dump to the state fair of Texas in my mama’s winning blue ribbon exhibit. Believe! Our family has not kept many of mama’s miniature rooms, and that was not the only blue ribbon she won. But we do have Resurrection in that doll house still. My mama’s little great great grandchildren ooh and ahh at it through a pane of plexiglass. And the hobby that began for me in my 20’s has kept a firm grip until this time in my 80’s. Helen tried to write this as a comment but that did not work so here is the sequel she sent me this afternoon! "I own a "cousin" to Resurrection, the little blonde china of this story. In the 1960s, my sister's family lived in Comanche, and on a visit to a junk shop there locally called M & S (though the faded sign said Mc's), I found a small brown metal object which proved to be a rusted tin doll head, a German Minerva for a 12" doll. I bought it for a few dollars (inflation had come to the doll market there), took it home with me to Fort Worth to a doll repair shop for repainting, ordered china arms and legs and a body pattern from my Mark Farmer catalog, made a body from a pale pink linen guest towel, and muslin pantalettes, petticoat and a dimity dress. The "professional" paint job proved to be amateurish and unsatisfactory, and since I didn't yet know Edyth O'Neill, I couldn't take it to her to fix. So I repainted it myself, not good, but better, and at least my own mess. My dear sister is gone now, but I still have that doll, packed away in storage waiting to see the light of day again. Edyth perfectly named her reclaimed treasure, but mine is still Nameless. Helen Pringle"
What a fun story--and beautiful miniature work! My mother loved to make miniatures and doll houses. We do take for granted how easy it is to get supplies, or even to find antique dolls...all at the click of a mouse. Hi, Folks - I accidentally deleted three great comments from Becky, Val H and an anonymous comment. Blogger does not allow me to retrieve them. Please resubmit! 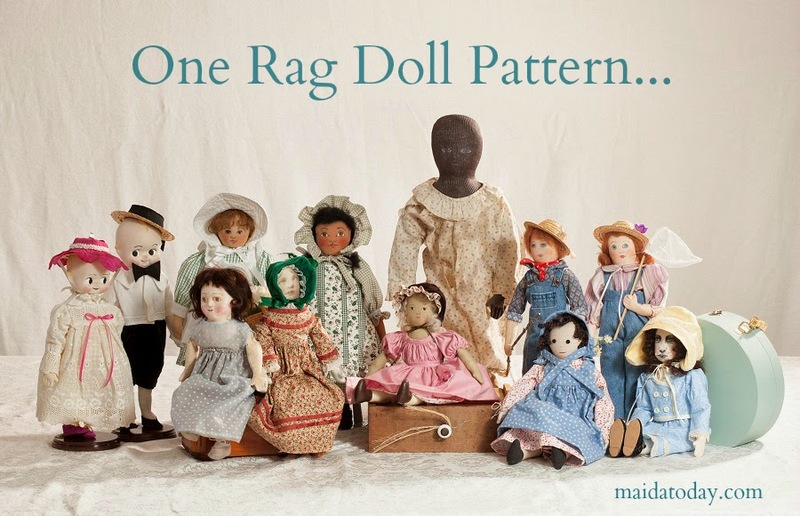 I really enjoyed Edyth's story of when she started collecting dolls. I can imagine how excited she must have been when she purchased her very first china head for 75 cents. I also loved peering into her doll house. How very sweet! Thanks for sharing the story Edyth! This is such a charming and nostalgic story! My own Mother, who is now 84, lived in Brownwood, Texas, and my dad was born in Trent, Texas...so this story brings back memories of their childhood days in Texas. (They met in the mid 1940's when both of their families had moved to California). I do remember taking a trip with my grandparents and my dad back in 1969, to a family reunion and I know we drove around areas in Comanche, Texas. Thank you for sharing this lovely doll story. It touches a soft spot in my heart.